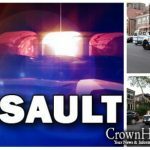 An elderly Jewish man was viciously assaulted in broad daylight while walking in Flatbush Tuesday afternoon. The assailant, described as a male approximately 5 foot 8, and 250 pounds, is presently wanted by the 70th Police precinct for the assault. The incident occurred around 3:30pm on Ave J in the heart of Flatbush. An elderly man was walking, when a man wearing a black shirt with the words “Stage Crew” in white on the back, started swinging at him. The man punched and kicked the Jewish man multiple times during the ten second assault. A bystander intervened, and after some words were said, the assailant walked away. There has been an increase in unprovoked and senseless attacks in Brooklyn recently, including the beating of a Chasidic man Boro Park, and a deranged assault in Crown Heights. 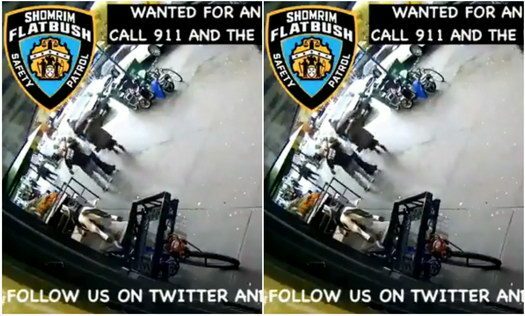 Flatbush Shomrim has tweeted out a video of the incident, and asks that if you have any info to call NYPD70Pct 911, NYPDTips at 1800577TIPS and the Flatbush Shomrim 24 hour hotline number (718)338-9797. Update: An earlier version of this article stated that the perpetrator was white. This information is unverified. On Yeshiva World News, it Seuss the perp is black. If you slow down the video, and maximize screen and pause it, you can see that the perp does not look white by his hair. Also, you can see he is holding a fancy little blue bag with letters on front …did he just purchase something from nearby? can bag be magnified ? credit card receipt of store to match time period ? At least as it stands now, the suspect’s race is not identified in the article, which means black. When a suspect’s race is not black, it is always specified. Did an earlier version of this article say he’s white? Or is the commenter confused? its not just the police. the PS schools are not dealing with any of these kids needs and issues. What has the KKK got to do with this?